This image was from Patricia and Dean’s wedding at the Hills Lodge, one of my favourite wedding venues in the Hills and Parramatta districts of Sydney. I love the happiness and positive energy radiating from the bride, groom and rest of the bridal party. The dress colours are very well choreographed by a top Hill’s wedding planner. 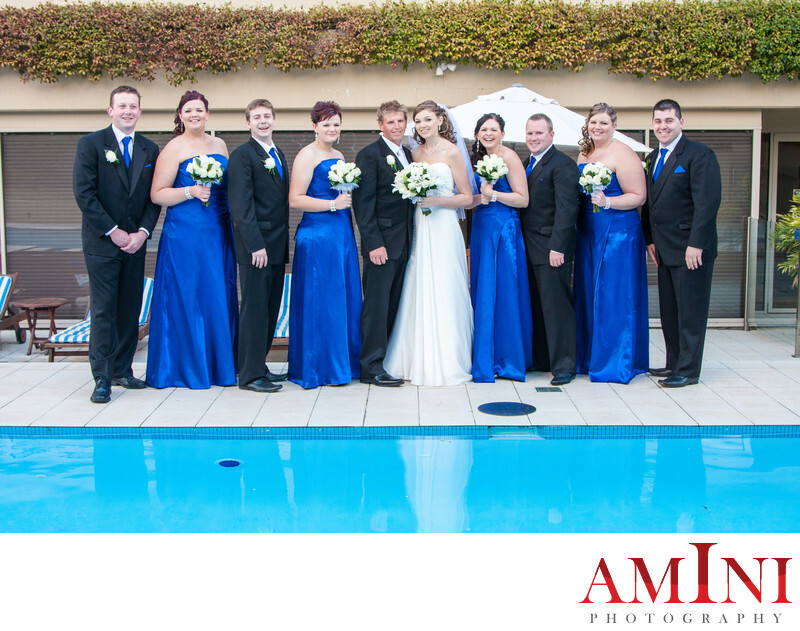 I love the nice reflection of the bridal party on the water surface. This image was loved very much by my client. The bride thought this photo captured the essence of their Castle Hill wedding. My thanks go to Cheryl Brooks and her event team at the Hills Lodge to make this day easier for the bride, groom and myself, by creating a very smooth wedding event. This photo is a beautiful shot and a perfect example of the advantage of having wedding photos taken by the pool with great reflection on water surface. It is important to do a complete search among photo professionals in the area and ask for a complimentary wedding consultation from the top photographers before deciding who would have this great responsibility and a privilege, to contribute to your once in a life time wedding celebration, and be your chosen wedding photographer in Castle Hill.